Arrive Delhi, Meet assist at the airport & transfer to hotel.Our representative will give you warm welcome at airport and you will be taken to hotel destination to relax and get free from travel lethargy. Enjoy the rich Delhi Style special breakfast, before leaving for brief sightseeing to visit local tourist attractions. This will not take more than three hours in the hotel's luxury car. You will explore the outside view of Rashtrapati Bhavan and India Gate, and visit Connaught Place, Himayun Tomb, Jama Masjid and Qutub Minar. 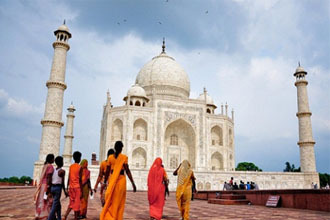 Delhi is one of the oldest cities of the world with rich ancient traditions and cultures. Delhi houses some of the marvelous and majestic monuments and restaurants offering blend of continental, traditional, Chinese Thai and various western cuisines. Vrindavan is also a small place lying adjacent to Mathura. Vrindavan is the place where Lord Krishna spent his youth playing with Gopis and Sakhas. Vrindavan is the place once known for the fragrant groves. While in Mathura and Vrindavan Tour, you'd find many places showing the life and different forms of Lord Krishna in an explicit manner..
Mathura Tour On the second day of the tour, you will experience one of the most beautiful architectural masterpieces of the world. Enjoy your delicious breakfast and get ready to explore the city of Agra. You will reach Agra via Fatehpur Sikri, another place of historical significance. On arrival in Agra, check-in to your re-booked hotel. Unwind yourself in the breeze of Agra and later have a sunset encounter with the enchanting Taj Mahal, the combination of moon and Taj Mahal is a lifetime experience. Return to hotel, enjoy dinner and relax.